I don't think I have enough words to tell you how much I enjoyed RED Hotel by Gary Grossman and Ed Fuller. But I will try. I don't think I have enjoyed a spy thriller this much since Tom Clancy stopped writing Jack Ryan, Sr. in the field. (There's even a reference to Jack Ryan in the book, so perhaps it is slightly inspired by Clancy). So many present-day spy novels focus on cyberterrorism and financial espionage. I liked that this story relied on some old school spycraft helped by modern technology. Dan Reilly is a really likable main character. He isn't without his faults, which makes him feel real. He has served in Army Intelligence, done a stint with the State Department (which I wondered if it was code for spy), and now is the V.P. of International for a luxury hotel chain. American hotels are prime targets for all sorts of acts of terrorism. Reilly isn't going to sit back and let harm come to the guests of his hotels. With his contacts, he is in the perfect position to make Kensington Royal the leader in hotel protection. But his position also puts him in the perfect position to collect more or less openly collect intelligence that goes beyond hotel safety. In this first book of a new series, past and present collide as Russia is eager to restore its world status and power that it lost after the fall of the Berlin Wall. In particular, the current (fictional) president of Russia is eager to right wrongs bad throughout the history of Russia. And he will stop at nothing, eliminating any obstacles any way he must, to get what he wants. The story weaves the last days of the Cold War with present-day current events. I really liked getting the historical back story. With most of our news focused on the Middle East, the general public probably has little knowledge of current affairs in the former Soviet and Eastern Bloc nations. I know I certainly don't really know what is going on there. So I appreciated the details and they are masterfully weaved into the story so you don't feel like you are getting a lecture or pulled out of the story. 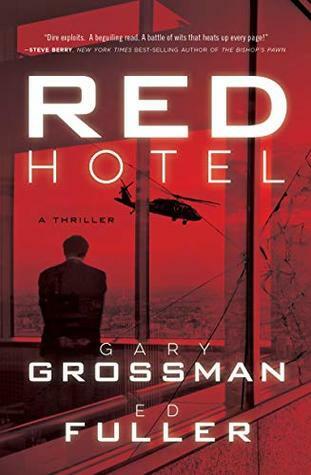 If you enjoy Cold War-era spy novels but want the thrill and pressure of current affairs, then RED Hotel is the perfect book for you.